This new series by Brian Bendis and Stuart Immomen drops in the original five X-Men into the present-day, just as the dust from the Avengers vs. X-Men event starts to settle. Though the use of time travel might feel a bit out-of-place here, a moment where their some of the cast's future selves wind up as unexpected extremists is a great set-up for Bendis to work his signature approach to character. This is the last issue of Garth Ennis and Darick Robertson's long-running superhero satire series. You could have read The Boys a couple of ways: as a damning critique of how one genre has oversaturated a medium, a treatise on how power corrupts anyone, as a straight-up adventure story or as a metaphor for the backroom dealings that supposed heroes has to make to meet their ends. Either way you read it, it's been a singular piece of sustained creativity and it'll probably go out with a bang. 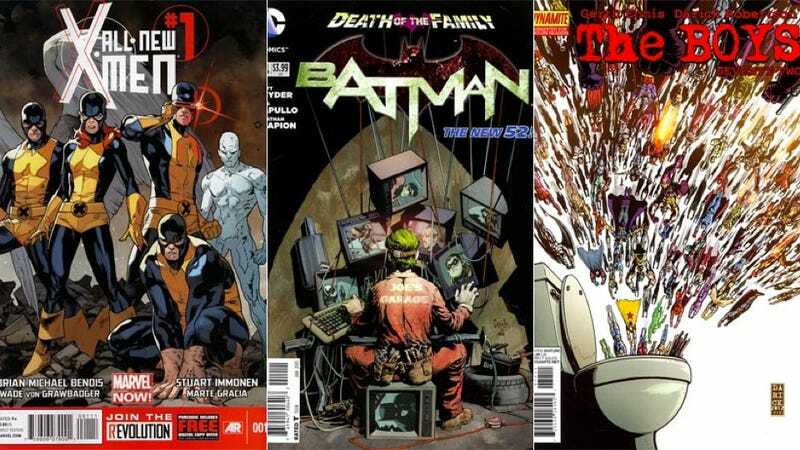 The return of Batman's archenemy is in full swing in the Bat-books. There's still a shroud of mystery surrounding the reasons that Joker is more vicious than ever and what his true goals may be. But it sure looks like he's trying to take out anyone who Batman and his allies may care for. For a mythos already so stained with grief, the events that transpire will have to be pretty disturbing to leave an impact.